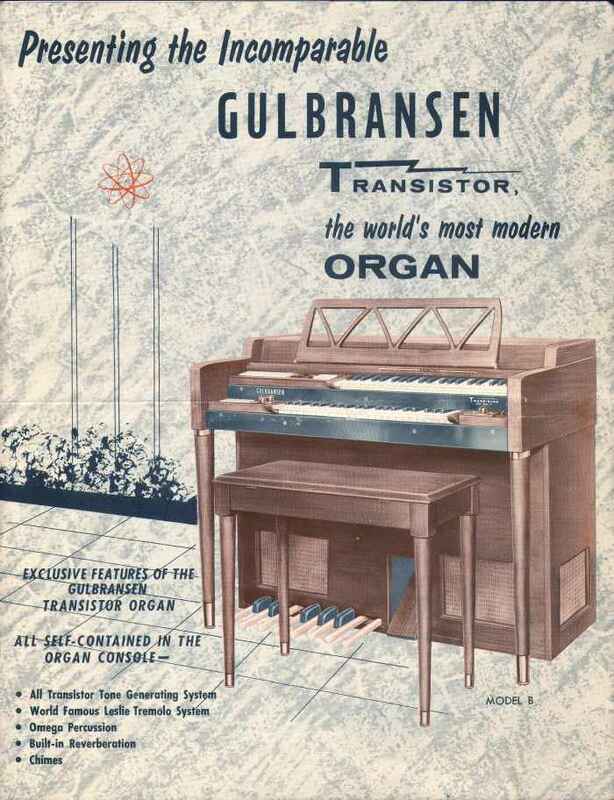 The Gulbransen Company began operation in 1904 producing pianos and reed organs. 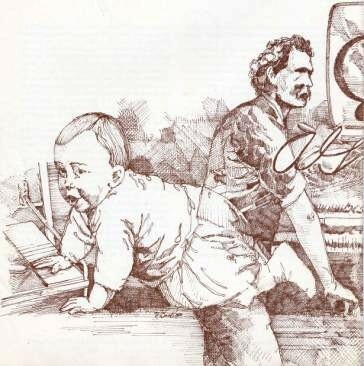 Their trademark of a baby operating the pedals of a player piano with his hands was well known. 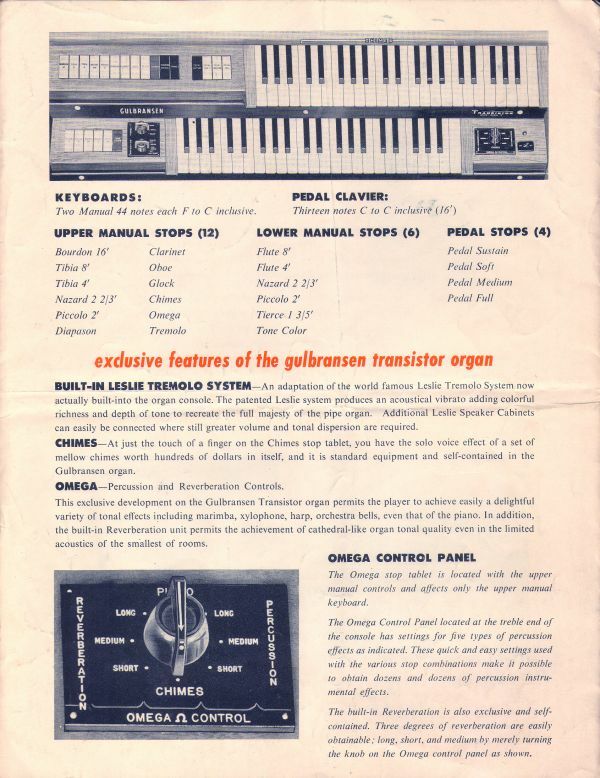 In July 1957, Gulbransen introduced its first electronic organ. 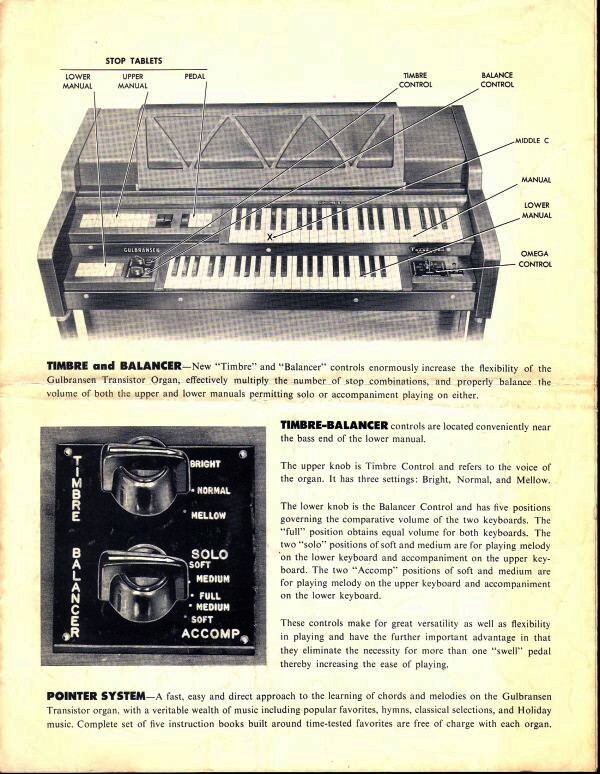 This was the Model B (Model 1100), a spinet that was the first transistor organ in the industry. It must be clarified that in these early transistor instruments, only the tone generators were transistorized. The amplifiers still operated with vacuum tubes (Rodgers produced the first all-transistor, or solid-state organ in 1958). A special note on that mysteriously named Omega control. What is Omega anyhow? I know Omega is the last letter of the Greek alphabet, the letter “U”. Omega is simply Gulbransen’s trade name for sustain. It offers a wide range of sustain varying from a very short reverberation to the long fading away sound of a chime. They used the last letter of the Greek alphabet to imply that this was the last word in sustain control. 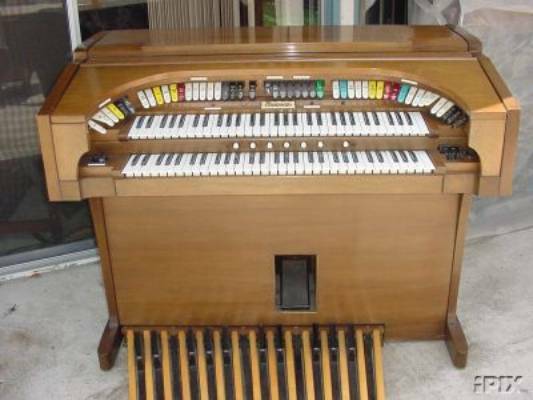 The most famous Gulbransen organ is the Rialto (Model K). This consists of two 61-note manuals and a 25-note pedalboard. It is a horseshoe theatre console with two sets of generators. 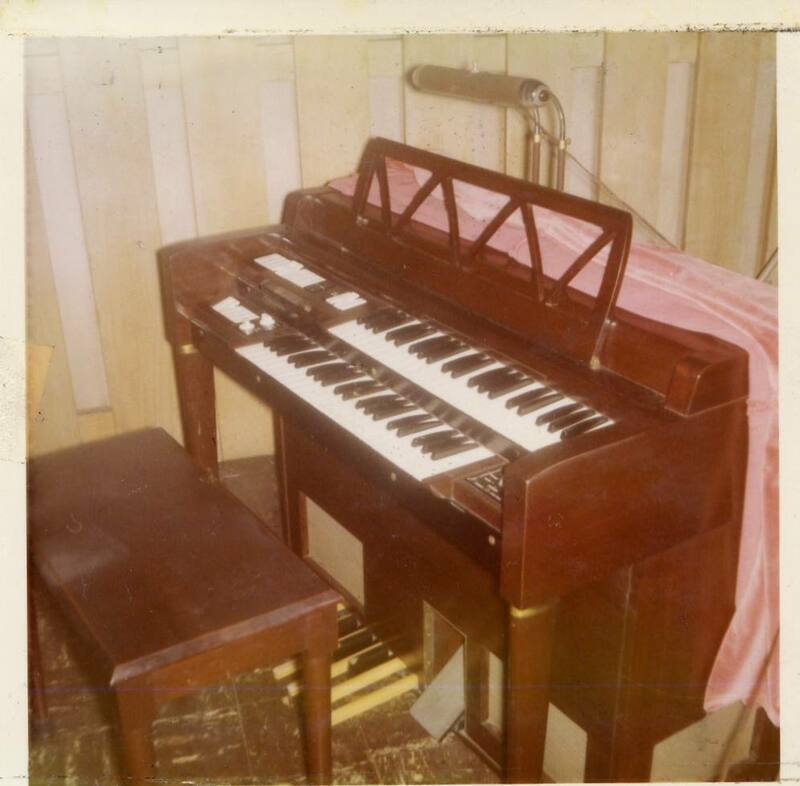 Two Isomonic Leslie speakers came as standard equipment with the organ. This organ has a true theatre organ sound. 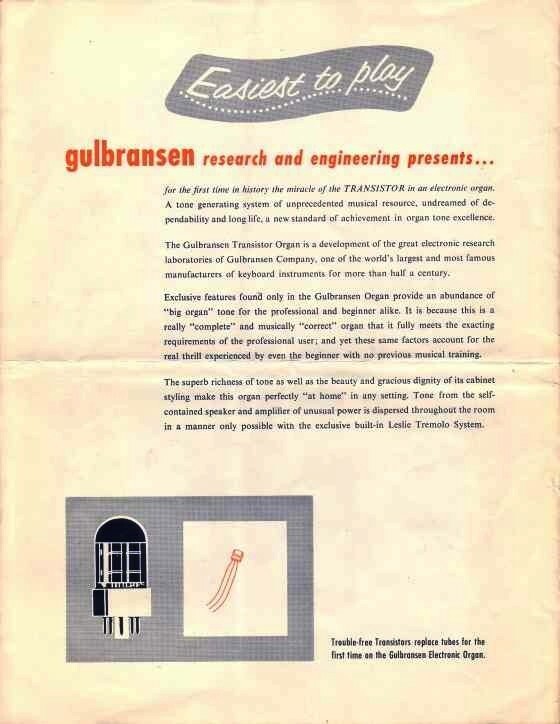 Gulbransen eventually merged with Seeburg, and then the entire operation was absorbed by C.B.S. 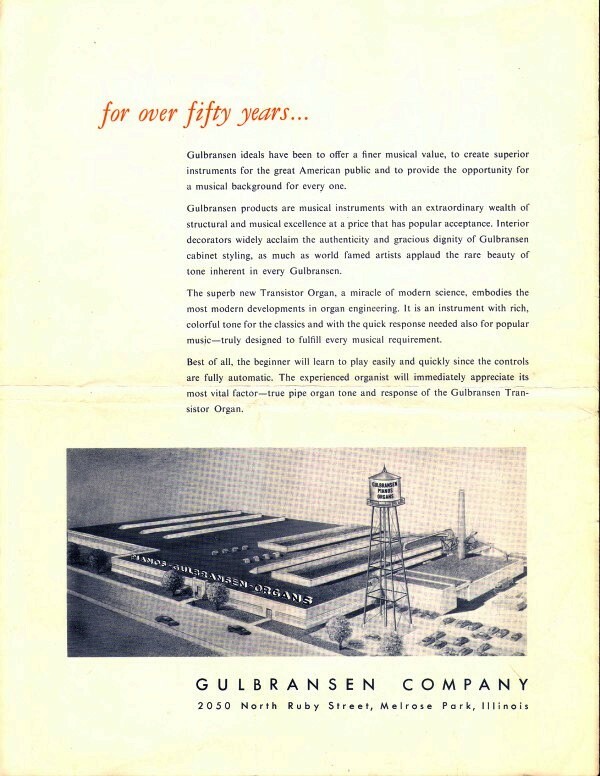 Gulbransen is now a division of Mission Bay Investments producing Elka organs with the Gulbransen name. They also manufacture a digital hymn performer that is in use in many churches. Do not ask me my opinion of this kind of organist replacement. 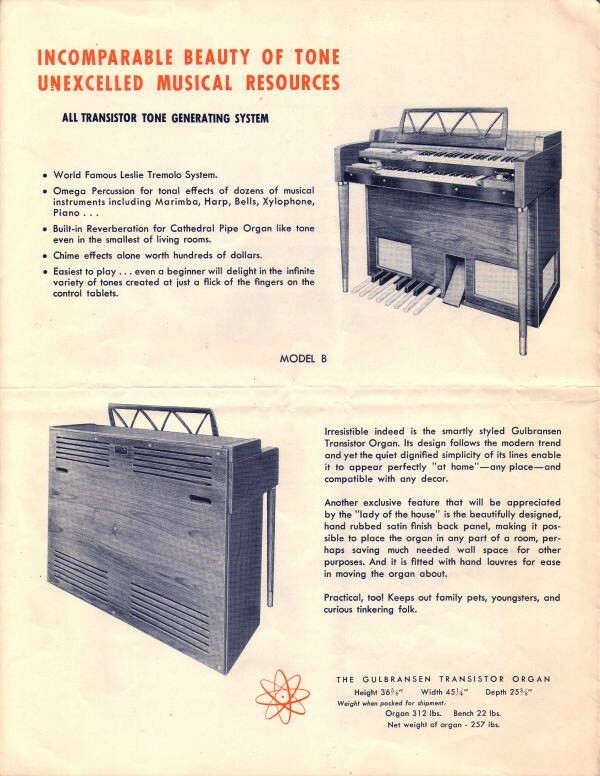 What follows now is the complete 1957 brochure for the Gulbransen Model B organ. This preserves an important milestone in the industry, as transistors were the first step toward integrated circuits and the microchip. Special thanks to Marie Glazar for her kindness in sending this original brochure. Gulbransen Rialto organ. This later version includes the piano stop.